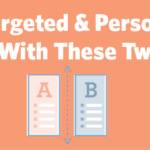 ﻿ How to Send Targeted, Personalized Emails with Two Simple Tools » Red Mango Marketing! Brands are trying to communicate with consumers 24/7. Whether they’re browsing their favorite social media sites, shopping online, or looking through their inbox, they may see upwards of 10,000 brand messages a day! The messages that work best are personalized on some level. Personalization can help your business stand out because your messages are more relevant to the people receiving them. In email marketing, stats show that personalized emails receive 11% higher opens and 27% more clicks. If that’s not enough to convince you to send more targeted, personalized emails, it’s easier than you think to get started and it doesn’t have to take a lot of time to stand out in the inbox. Adding your customer’s name to an email is just the beginning of personalization. Beyond that, it’s about understanding that your contacts are different and sending timely, relevant content to them. With Constant Contact’s Click Segmentation tool, you can do just that. All you need to do is enable the feature when setting up your email campaign. When your contacts click on the link, they’ll automatically be added to a list that you’ve chosen, saving you from having to segment contacts manually. Let’s take a look at this email from Southside Cycling. 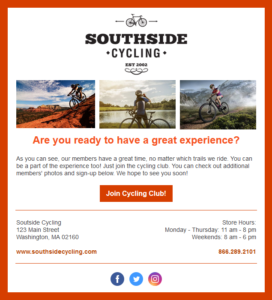 Southside Cycling sends an email to gauge interest in their Cycling Club because they know that people who join the club spend more at the store than those who haven’t joined. You can see that they included a link for people to ‘find out more’ to receive additional information about the club. When contacts click, they are taken to a page on Southside’s website, and behind the scenes, they are added to a Cycling Club Prospects list. Now Southside Cycling has a list of people who have shown interest in their club. Now it’s time to send more relevant follow-up information. 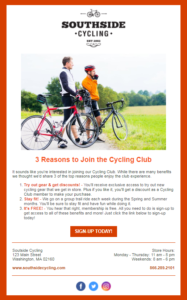 Using Constant Contact’s Autoresponder tool, Southside Cycling has set-up a series of emails that begin sending when a contact is added to the Cycling Club Prospects list after clicking on the link to “find out more” in the previous email. Each of these follow-up emails is designed to provide more information to entice prospects to join the Cycling Club. The first email in the series sends immediately after a contact clicks the link to ‘find out more.’ This email provides a quick introduction to what the club is about and the most common reasons that people join. The email also includes a button so people can sign-up for the club. A few days later, email two introduces John, the group leader. This email talks about John’s experience and how he can help members become better cyclists with his expertise. It includes a link so that people can attend the next meet up where they’ll encourage attendees to join the club. Then, a few days later, the third email is sent. Here, Southside Cycling shares eye-catching photos from club members. Who wouldn’t want to join the club after seeing the impressive scenery and all the fun members are having? This email is used to invoke a fear of missing out and includes a link for contacts to join the club. That’s just one example of how to send more targeted, personalized emails. 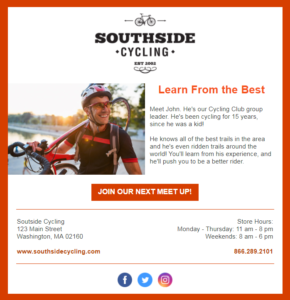 By using click segmentation and automation together, Southside Cycling can automatically segment their list based on where contacts click and then automatically send timely and relevant follow-up emails that get people to take action. With Constant Contact’s Autoresponder, you can create as many series as needed. Plus you can schedule these emails on a timeline you choose. You can send more timely, relevant emails too. No matter how you choose to use these tools together, you’ll maximize your email marketing efforts and save time. You’ll get your contacts to take action by sending timely, relevant information that feels more personalized to their interests. What kind of Autoresponder Series will you create? Tell us in the comments. The post How to Send Targeted, Personalized Emails with Two Simple Tools appeared first on Constant Contact Blogs. This entry was posted on Monday, March 12th, 2018 at 8:00 am	and is filed under Automation, Email Marketing, News & Updates. You can follow any responses to this entry through the RSS 2.0 feed. Both comments and pings are currently closed.